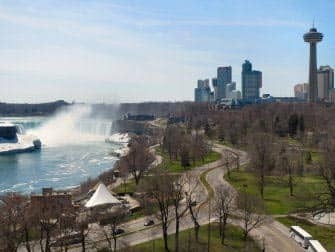 On the New York to Niagara Falls by plane day trip you can forget all your worries about planning! Early in the morning you will be collected from your hotel in Manhattan (at any hotel located between 23rd and 74th Street) and brought to the airport where you’ll catch a flight to Buffalo Upstate New York. In only one hour you will arrive and be greeted by a professional guide who will accommodate you on a bus headed towards Niagara Falls. You don’t have to worry about a single thing – it has all been taken care of for you. The tour is extremely popular, and often fully booked, so it is required to book at least 5 days prior to departure. 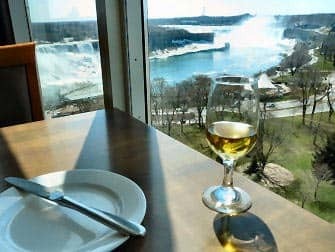 Before visiting the famous falls themselves up close, you will be able to have a sneak peek by having a buffet lunch with a panoramic view of the falls. Afterwards you’ll take the exciting Maid of the Mist. 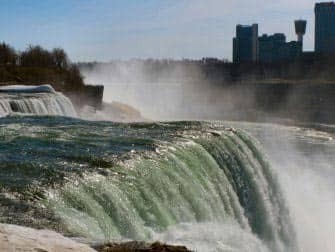 This ferry service has been operating since 1846, will allow you to really feel the power of the Niagara Falls as it travels right up to the base of the Horseshoe Falls. Experience the magic of the falls as the mist surrounds you! 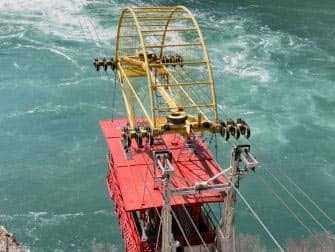 The Maid of the Mist is typically operational during the warmer months (May until October) and if you are visiting in the winter months, you will be able to see the falls in a very different way. 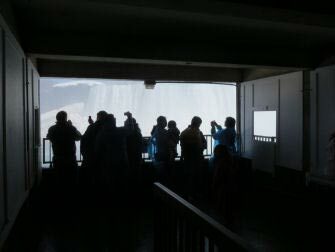 You will take the Journey Behind the Falls – an elevator that takes you behind the massive sheet of the Niagara Falls. Hear the thunder of the Niagara Falls roar from 13 stories above you. Dropping vertically at 50 meters, every minute more than 160,000 m3 of water falls over the edge of the falls, making it not only a natural spectacle but also an extremely powerful waterfall. 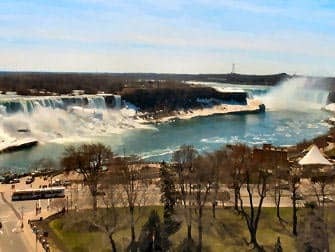 You will be able to view the falls from both the American and the Canadian sides; see the Horseshoe Falls, the Bridal Veil Falls and the American Falls. You’ll also see the Niagara Whirlpool. Snap loads of photos and decide which of the sides has the better view of the falls. Eric’s Tip: Of course I’ve done this tour myself: all the pictures on this page are from this tour. It’s expensive, but I found it really worth the money! Niagara Falls is the largest tourist attraction in Canada which means that it can be crowded. I was there in April with good weather and hardly any people. If you have the possibility, do the trip on a Monday, Tuesday, Wednesday or Thursday because it’s a lot quieter than during the weekend. After purchasing, you will receive a voucher that you can print out and use as your ticket for the day trip. Note: All passengers must have the correct documentation to enter Canada. Do you have a Australian passport? Then there is no need to apply for a visa. Since you’ll be landing on the American side of the border and a bus will take you to the Canadian side, you’re not required to obtain an eTA for Canada. When booking this trip you can get asked for your passport name, number and expiration date, date of birth as well as contact details for residence at the New York hotel. 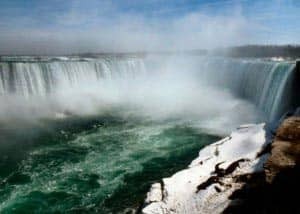 If the tour is not available on your preferred date, then book this Niagara Falls Fully Guided Day Trip.